RMK will release a new Pressed Powder N and Smoothing Polished Base on 4 March in Japan. The Pressed Powder N (4725yen) contains "snow leaf powder" for enhancing skin translucency and "micro beads powder" for oil control. 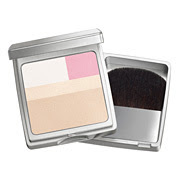 Available in 5 variations with SPF14 PA++, it comes in a stylish two-layer compact. The Smoothing Polished Base SPF13 PA+ (2625yen, 20g) has a gel texture and helps to conceal pores and even out the skin. It is formulated with a water-resistant "super shield oil" that helps foundation to last longer. looking forward; RMK makes some really good base makeup! -h.